Are you looking for the ways to increase the Adsense earning through increase CPC & CTR Adsense rates? This is the right place where you can find great tips & techniques for increasing Adsense earnings through high Adsense CPC rates of your blogs. Google Adsense is the best Ad network and its the first choice of newbies who just started money making blogging. Adsense is the Google's property well known for high CPM rates that allow publishers to display Google CPM ads on their blogs. AdSense works with AdWords advertisers bidding on your ad slots for how much they're ready to pay per click for their ads. As an AdSense publisher, you could get as low as $0.01 or more than $50 per click. So if Adsense is the primary source of income for you, then it is recommended to get high eCPM rates and get more Cost Per Click by following Adsense terms & conditions for Adsense optimization. If you are able to drive massive search traffic but your monthly AdSense revenue not adding up to what you expected then you need to understand that you’re missing something. And the question is WHAT? What is the CPC? What is a good cost per click? What techniques used to get High CPC rates? How much does Google pay per click? How much can you make from Google Adsense? How much Adsense pay per click? The keywords play an important role in how much can you make from Google Adsense. Here the website owner can use high CPC keywords by Adsense to increase their online visibility and click-through rates. 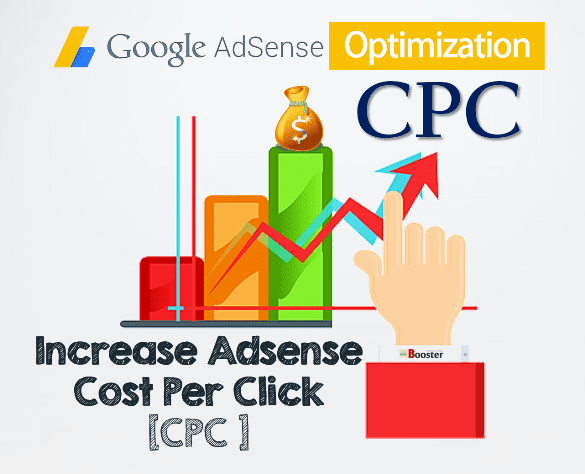 There are great ways to increase the Google Adsense price per click (CPC rates) listed here that will help you to earn more on Adsense. CPC is Cost Per Click. It is the money the blogger can earn for each click made on Google Adsense ads placed on the blog website. Google Adsense is the high paying and trustworthy monetization technique. When someone clicks on the ad displayed on your blog post, you get money for the same. In simple words, how much money you receive from such click is called as COST PER CLICK = CPC. The CPC rate by Google Adsense varies from $0.1 to more than $50 depending on the location and their advertisements. There are the possibilities that the CPC goes down even though you are getting more traffic for your content. It is also observed that the CPC that goes up serving high rates consistently for several months starts falls down. Some bloggers experience reduced average CPC. There are many reasons behind such situations. There are different factors those affect the Google Adsense CPC rate fluctuations. It is thus necessary to work on Adsense optimization for improving your CPC rates and to maximize Google AdSense estimated revenue. 1. Niches and high paying Adsense keywords. The niches and topics have a great impact on AdSense CPC rates. Always keep an eye on trending topics and relevant pages in your niche. Using webmaster tool, check what people are looking and searching about to reach your site. If you have read; 5 Reasons, Why Keywords Are So Important for SEO Optimization, you got to know that according to the keyword research, you can choose high CPC keywords and try to use them with more organic keywords in your content to get more people on your site that will ultimately help to improve adsense revenue. 2. Create a custom channel for ad units so as to increase CPC rates. To increase the CPC rates, it is suggested to create custom channels for ad units. Creating custom channel serve more targeted ads for the blog pages. More targeted ads mean more bidders or advertisers from Adwords looking to spend money on your ad slots that result in more amount of money and so more revenue from your AdSense account. 3. Allow both image ads and text ads for higher CPC rates. Generally, you can have five types of AdSense ads namely text, image, rich media, flash and animated image that are categorized under text and display ads. Try to provide large possibilities for bidders for your ad slots to bid higher by enabling text as well as display ads. It is strongly recommended to allow both text and display ad types for your AdSense ad units. 4. Use high performing ad formats for boosting CPC rates. You can even improve Google AdSense CPC and boost conversion rates by using high performing ad formats. It is suggested to use Leaderboard (728x90), Medium (300x250) and large (336x280) rectangle ad layouts and ad slots. For the mobile web page, it is recommended to use the mobile banner of 320 x 100 sizes. For responsive themes or templates, it is recommended to follow the ad format that can fit into all ad spaces irrespective of the visitor’s device. I would like to suggest you go with text ad format because text ads have higher CTR than graphic ads. 5. Using single advertising network for better CPC rates. For better Adsense CPC rates, it is a smart way to avoid advertising from different ad networks. It is recommended to use Adsense ad network which is really a great ad network available today. As compared to others, Google CPM ads are high paying and have great CPM rates. It strictly warns you to avoid incompatible ad network with Adsense at the same time. Moreover, if you getting very low CPC and CPM from Adsense then you may try and use other compatible Adsense alternatives, but the probability of getting lower bidding for your ad slots. 6. Block lower paying ads from AdSense dashboard. Adsense allows you as a publisher to allow and block certain ads. You can choose from which particular ad provider site to be shown on your blog and which not. Blocking unwanted ads will increase the number of bids in real time from high-paying bidders that resulting in increased CPC rate. 7. Puts ads in the right place where your customers are. Placing ad units is really a great challenge. Initially, the Google Adsense was allowing placing 3 ad units for display, but now the ad limit is removed. It is recommended not to put all the ad unit codes in a single location. Arrange the ad units in such a way that it will attract the readers and visitors to read the content and click on the ad. Note that, the ad limit is removed that doesn't mean you can add more number of ads, just make sure the content is more valuable and only sufficient number of ads are placed on the quality page. 8. Visitors location and CPC rates. The CPC rate also depends upon the location from your visitors accessing your website. Make sure that the relevant ads come from the advertisers located in their country. 9. Changing the site’s layout to improve CPC rates. It is advisable to build an attractive, unique and interactive website. It is very important to check how your website layout work for different screen sizes and devices for your page with content & ad units. Avoid placing all three AdSense ads above the fold. You can place the ads close to the content. Always keep in mind you are serving the quality information from your content and not ads to your visitors. 10. Connect with Google Analytics to find higher CPC rating pages. It is recommended to search for the page from your website that has higher CPC rates. Find out what topic attracts the visitors on your site. Check which pages got more clicks. You have to write more content related to such pages which having higher CPC rates. Ultimately, it will result in increased earnings from Google Adsense. 11. CPC rates and your Domain name. Domain name is the first word of the URL. Like keywords, the CPC rate also depends on the site’s domain name. As domain name tells about the contents of the website, it is vital to choose domain name wisely. Create a domain name that relates your site contents and keywords. 12. Build quality content to increase CPC rates. Google Adsense is principally for content ads and is, therefore, the quality of the content having immense importance in Adsense optimization. Therefore, writing attractive, user-friendly, easy-to-understand and engaging content is worth. You can make use of bulleted points, subheadings, images, etc. in your content. 13. Using responsive templates and themes for increased CPC rate. As discussed earlier, it is necessary to add responsive themes and templates to the blog website. Well, using responsive templates and themes would result in increased CPC rate. Make it sure that you need to use templates and themes that can be responsive on different mobiles, tabs, computers, laptops, etc. and able to get displayed on different screen resolutions. 14. Experiment A/B testing for higher CPC rate. To make the content more attractive and interesting, you can add something new. Sometimes, different ads than your content work better. This will definitely help you boost CPC rate. Make A/B testing with your blog website that can impact positively on the Adsense CPC rate. 15. Know your customer to get higher CPC rate. It is very important to know who your customer is; accordingly, you need to write the content and add relevant ad units. This will help you to have increased CPC rate from Google Adsense. Google Adsense is the most popular high paying CPM ad network for Cost per click or Pay per click. The website owners can use this great platform for increased visibility and click-through rates and cost per click rates. There are different ways and techniques to increase the CPC rates as mentioned above which ultimately lets you maximize AdSense revenue & enjoy higher income from your blog. Again, it is not that, you can rest with one or two options. It is advisable to try all the different options available to boost your CPC rates and earnings. Make sure that you add relevant ad units to your blog page with perfect layout focusing on the target audience for increased Adsense CPC rates and income.